Science fiction authors have fantasised about an elevator that could reach into space since Arthur C Clarke’s A Fountain of Paradise. Now the discovery of carbon nanotubes could make fantasy a reality. These threadlike structures, less than 1/50,000 the width of a hair, are stronger than steel: a string the size of a sewing thread could bear the weight of a car. Full text on the Sunday Times website here, or read on. 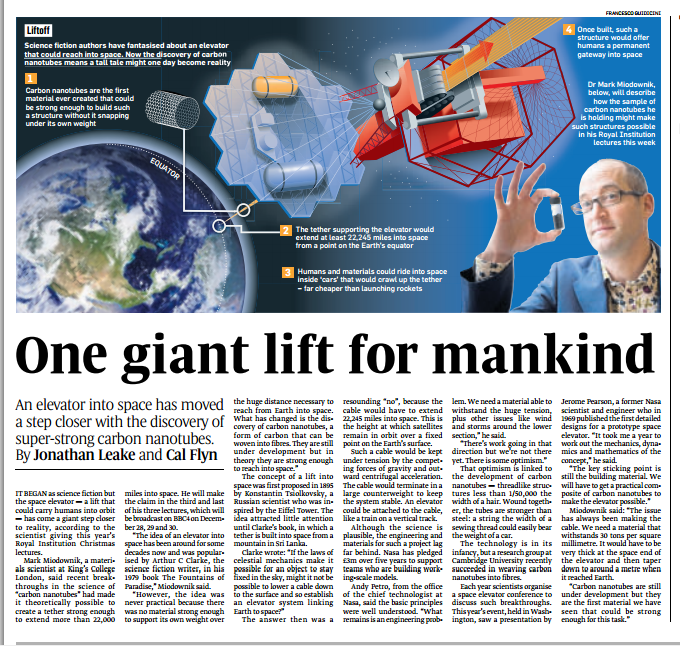 It began as science fiction but the space elevator — a lift that could carry humans into orbit — has come a giant step closer to reality, according to the scientist giving this year’s Royal Institution Christmas lectures. Mark Miodownik, a materials scientist at King’s College London, said recent breakthroughs in the science of “carbon nanotubes” had made it theoretically possible to create a tether strong enough to extend more than 22,000 miles into space. He will make the claim in the third and last of his three lectures, which will be broadcast on BBC4 on December 28, 29 and 30. “The idea of an elevator into space has been around for some decades now and was popularised by Arthur C Clarke, the science fiction writer, in his 1979 book The Fountains of Paradise,” Miodownik said. The concept of a lift into space was first proposed in 1895 by Konstantin Tsiolkovsky, a Russian scientist who was inspired by the Eiffel Tower. The idea attracted little attention until Clarke’s book, in which a tether is built into space from a mountain in Sri Lanka. The answer then was a resounding “no”, because the cable would have to extend 22,245 miles into space. This is the height at which satellites remain in orbit over a fixed point on the Earth’s surface. Such a cable would be kept under tension by the competing forces of gravity and outward centrifugal acceleration. The cable would terminate in a large counterweight to keep the system stable. An elevator could be attached to the cable, like a train on a vertical track. Although the science is plausible, the engineering and materials for such a project lag far behind. Nasa has pledged £3m over five years to support teams who are building working-scale models. Andy Petro, from the office of the chief technologist at Nasa, said the basic principles were well understood. “What remains is an engineering problem. We need a material able to withstand the huge tension, plus other issues like wind and storms around the lower section,” he said. That optimism is linked to the development of carbon nanotubes — threadlike structures less than 1/50,000 the width of a hair. Wound together, the tubes are stronger than steel: a string the width of a sewing thread could easily bear the weight of a car. The technology is in its infancy, but a research group at Cambridge University recently succeeded in weaving carbon nanotubes into fibres. Each year scientists organise a space elevator conference to discuss such breakthroughs. This year’s event, held in Washington, saw a presentation by Jerome Pearson, a former Nasa scientist and engineer who in 1969 published the first detailed designs for a prototype space elevator. “It took me a year to work out the mechanics, dynamics and mathematics of the concept,” he said. Miodownik said: “The issue has always been making the cable. We need a material that withstands 30 tons per square millimetre. It would have to be very thick at the space end of the elevator and then taper down to around a metre when it reached Earth.